Take a scoop of Vaseline in a container and put in microwave for 1 minute. keep putting it on for 1 minutes till it get melted. it took me 6 minutes to get it melt completely. 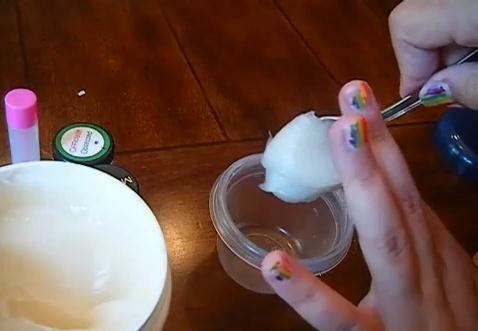 Take about half tea spoon of your body butter and mix it in the liquid Vaseline. Now take a small amount of your eye shadow which u don't use much or don't like it any more and mix it well in the liquid Vaseline... keep adding the shade till u get the color u like. make sure u put a napkin on your desk..
Glides on to the Lips smoothly. Has scent of your own choice.